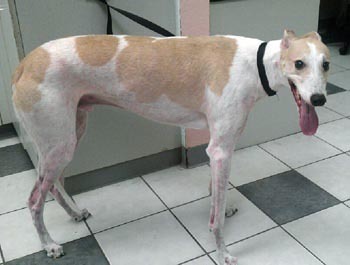 Derek is an 8-year-old, untattooed, white & fawn male born in 2004. 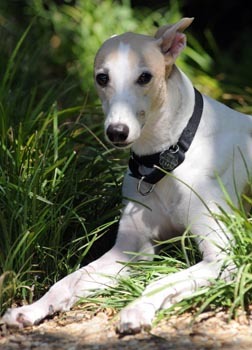 He had been in a home for six years, but was surrendered to GALT due to financial difficulties. Derek is a sweet, big boy who lives peacefully with cats. Derek is a love. An easy-going, sweet, silly, propeller-tail wagging, whining-when-he-wants-to-go-out, peanut-butter-and-tuna-loving pooch. He came to us with a sore paw, but valiantly went on his walks, unfazed by the protective bootie other tough guys might find a bit embarrassing. Now that he is free of the footie, he's not averse to a little jog-action, though he still is quite content to keep the pace of his foster brother, who is 11-going-on-5. Our two cats might as well be light posts, all the attention Derek pays to them. On second thought, if they WERE light posts, he'd probably pee on them. 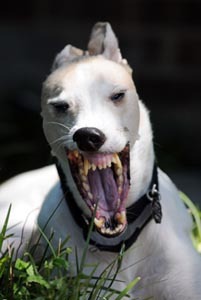 When I get home, he's the first one at the door, his tail moving in that dizzying circular motion, his teeth smiling that you-are-my-reason-for-being smile. He sometimes plays with a toy, but more mostly sleeps. I've thought at times he must have disappeared because I see our dog but not Derek sleeping. Then I look more closely and there he is, burrowed under the blanket on his dog bed. He has never had an accident in the house; when he wants to go outside, he whines. He's also been known to whine when he wants to go for a walk, when food approaches, or just to hear his voice. We've yet to hear him bark though. Derek is patient when it comes to eating; he doesn't mind that the bowl of his older foster brother is placed on the floor before his. He'd probably be OK as an only dog, although I think he really likes having a pal. One other thing -- in addition to all his inward beauty, he's a very handsome guy.